Supreme Leader of the Islamic Revolution Ayatollah Seyed Ali Khamenei on Sunday stressed the great importance of Tehran- Moscow cooperation and said the two sides can serve as partners in the political, economic, regional and international domains. Receiving Russian Security Council Secretary Igor Ivanov, who submitted him a message from Russian President Vladimir Putin, Ayatollah Khamenei said that Islamic Republic of Iran welcomes all-out expansion of relations with Russia. "The Islamic Republic of Iran welcomes all-out promotion of relations with Russia, believing that capacity for expansion of ties between the two sides is higher than expected," said the Supreme Leader, while voicing pleasure with Putin's message. Ayatollah Khamenei said Iran and Russia hold half of the world's total gas reserves, adding, "The two countries through mutual cooperation can establish an organization of gas exporting countries like OPEC." Referring to conditions in Iraq, Afghanistan, Palestine, and Lebanon as well as to the US unilateralism, Ayatollah Khamenei stressed, "Despite its huge attempts, the US has not yet been able to materialize its goals in the region. Active cooperation between the Islamic Republic of Iran and Russia on regional issues within a defined framework can be effective in foiling the US ambitious plans." Pointing to Putin's emphasis in his message on continued cooperation between Tehran and Moscow in all domains, especially in completing and commissioning Bushehr nuclear power plant, Ayatollah Khamenei hoped the two sides would speed up implementation of their commitments and obligations. 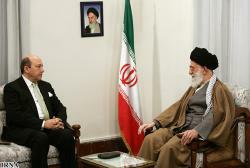 On his part, Ivanov said that Moscow is seriously determined to expand ties with Tehran in all fields. He said the Russian president believes the two countries should use all their capacities for promotion of strategic relations and cooperation both at bilateral, regional and international levels. With the increasing crime rates these days, it is best that you find ways to protect your belongings whenever you are indoors or outdoors. But the most important thing you have to protect is your home, especially if you and your household members are not at home most of the time. Nowadays, keeping valuables in the bank�s safety deposit box are no longer the only available way to safeguard your valuables. With the advent of technology and creative inventions, wall safes are now considered as the next best thing to safekeeping. Are you saying that Russia is "our" enemy? Russia's finger prints are on the training tactics of the terrorist insurgency in Iraq. That is for sure consider Saddam himself was also a close ally of Russia along with Syria and Iran and despite the differences between Saddam and the Iranian regime back in the Iraq-Iran War, Saddam was still supplied by the Soviets even more so than the U.S. ever did and China was backing Iran and Iraq at the same time! My office has run out of tea. Given the significant cultural role tea plays in Russia and the Soviet prediliction for commodity shortages, this problem appears to have the fingerprints of the Russian government all over it. I further note that the old Russian tradition of placing a lump of sugar in the mouth before drinking bitter tea has died out there, but is still common in Iran. This clearly demonstrates that one or other country is a client state of the other. Come to think of it, I once ducked into a small factory in Yazd, Iran that produced the cones of sugar used for this purpose and discovered one of the workers was from Iraq. I smell an axis of evil forming. Gee Sam. I hadn't considered that angle. The Russians are into everything. What were you in Iran for Sam? I was in London and keen to see Hunza in the north of Pakistan. For a number of reasons this mission snowballed into an overland trip from London to Bangkok. I don't particularly recommend trips like that for pleasure (Mongolia is much more fun), but it was very educational. The Hunza are pretty legendary-longevity, great health etc. Did they live up to their rep, or was it mainly just health food company hype? Well, they seemed a pretty happy and healthy bunch, but I'm told the longevity was a bit of a myth. Nice place though, amazing scenery, good food, especially the apricots, and very easy-going, they are mostly Ismaili, but religion doesn't seem a big deal there. The economy has taken a dive as they were getting a decent tourist trade before the post-September 11 fear-mongering, but I didn't see any sign of severe poverty.